Camping with South African Equipment, except on Marangu route which has basic huts. The porters will carry 12Kg of your stuff in a soft duffel bag or backpack. Situated south of the equator - in Tanzania - at 19 340 feet, (5895m) this is Africa's highest mountain and the highest "free standing " mountain in the world. Huge permanent glaciers flow down from the summit, and spectacular views and beautiful ice formations are the reward for the successful trekker, as well as the satisfaction of conquering this mighty peak. Good preparation and advice, as well as good guides on the mountain, have given us an over 95% success rate (the average is 60%) - this type of thing is a "once in a lifetime " challenge, and must not be taken lightly. The summit of Kilimanjaro can be reached by any reasonably fit person who enjoys walking. The youngest to make it was nine years old - the oldest seventy nine. Because of Kilimanjaro�s great height, the mountain influences its own weather. Winds incoming from the Indian Ocean are deflected upward by the slopes and drop their moisture as rain and snow. This moisture results in a variety of vegetative zones that contrast dramatically with the savanna grasses and semidesert scrub on the surrounding plains. The mount�s lower slopes, probably once forested, have been cleared for the cultivation of coffee, corn, and other crops. At higher elevations [approximately 9800 feet (3000 meters)] lies a belt of tropical rain forest that gives way to grasslands and moorlands. This belt, in turn, is replaced by high-altitude desert [near 14 500 feet (4400 meters)]. At the highest elevations is a zone of permanent ice and snow that is responsible for the name Kilimanjaro, which in Swahili means "the mountain that glitters." There are several principal hiking routes up the mountain: Marangu, Shira, Londorossi, Umbwe and Machame. The Machame is one of the more scenic routes up the mountain, after the Umbwe route, this is probably the most beautiful route by which to ascend the mountain. Nights are spent in 'mountain tents' sleeping two persons per three-man tent(so there is space for your luggage). All your supplies and camping equipment are portered up for you (tents, 25 mm sleeping mats, awnings, stools, lights, etc), and your meals are prepared. Your personal baggage limit is 12 kg for the climb. South African tents and sleeping mattresses are supplied on this trip. 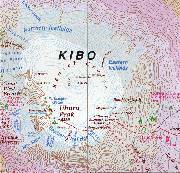 The guides employed are excellent (some have climbed Kili over 400 times)! They are employed by the Keys Hotel and have looked after a multitude of our clients. Each trip is lead by a senior guide, with other guides in a ratio of approximately one guide per 2 or 3 climbers - if you are a bit slower than the rest or get ill and have to descend, a guide will always be with you. Food served on the mountain is generally plain and wholesome, including a lot of carbohydrates and fresh vegetables. Vegetarians are catered for, but please notify us in advance. Price includes: economy class airfare Johannesburg/Kilimanjaro/Johannesburg. All airport/ airline taxes. Return airport to hotel transfers. Accommodation at base hotel on a dinner, bed and breakfast basis (Marangu route) / bed and breakfast basis (Machame/Umbwe routes). All porters, guide, park fees, hut fees, (camping fees if applicable), all meals and mountain rescue while doing the climb. Detailed itinerary and information pack - medical list, equipment list, etc. T-shirt. Discount on equipment rental and purchase. Price excludes: Visas, travel insurance, health requirements, equipment rental, tips (compulsory tip on climb = budget approx. USD 90-100 per person), drinks, all items of a personal nature and any service not specified. Vodacom has coverage on certain parts Kilimanjaro and in Tanzania, so remember to organise an international roaming facility. If you are travelling on a South African passport you will need a visa for Tanzania. You can obtain this visa on arrival at the airport before clearing customs at a cost of US$ 50 per passport (USA, UK, RSA, Netherlands & Ireland). TIP - We recommend approximately USD 90-100 per climber. If you want more time to acclimatize or enjoy the scenery / route more we can arrange additional nights on the mountain (Machame/Umbwe routes) @ R 1 030 pp sharing, per extra night. Individual travellers - important note. If you would like to join a group departure together with other climbers, we will be undertaking such trips throughout the year. Please enquire for dates/routes. Day 1: When flying, we strongly suggest you wear / carry on you, your boots, wet weather gear and cameras - these are crucial for your climb, and you do not want to risk loosing them in the hold. Make sure you have your yellow fever certificate with you - whilst it probably wont be asked for on arrival in Tanzania, when you return home it may be requested. Check in at the Air Tanzania's check in counters at Johannesburg International Airport two hours prior to your flight departing. The flight is approximately 4 hours and you will arrive at Kilimanjaro International airport in the early evening. Keys Hotel will meet you on arrival and transferred to the Keys Hotel, approx 1 - 1.5 hours drive. Overnight, bed and continental breakfast. Climb briefing. Liaise with staff at reception, and leave them your air tickets to be reconfirmed during your climb. It is your responsibility to ensure that flights are reconfirmed, as any schedule changes will be advised at that time. Day 2: Driven to Park Gate (approx one hour) where you will meet your guide and porters. The guide has an amount of paperwork to do at the gate, as well as organising the porters - these things take time (African time!) - please relax, sit down and enjoy the scenery - don't get anxious about starting off - it will only get you stressed out!! The larger the group, the longer it will take - be prepared to wait for anything from 1 - 2 hours. Discuss with your guide, in detail, the route and each day's activity. A five hour walk through the spectacular forest will bring you to Machame Hut at 3000m. This day wear your hiking boots and ensure you keep your wet weather gear with you. Shorts and t-shirt will be sufficient. There are patches on the route where it is VERY wet and muddy, and you may end up with pretty wet boots this evening. Ensure your boots are waterproofed, and that you have spare lightweight shoes to wear in camp this evening. ALWAYS keep your boots and water bottles INSIDE the tent at night - otherwise they will freeze. Fill up your water bottle at night, and purify it - allowing some of the chlorine fumes to dissipate. Take it SLOWLY today, you will encounter some steep parts on the climb - but generally its not too strenuous. The porters walk ahead and sometimes with you - make sure every day, that you have all your personal gear needed with you as you will not have access to your bag. Camp will be set up by the porters and your meals will be prepared by the guide. Conditions are difficult on this route, and your guide / porters will do everything they can to make your climb pleasant and as comfortable as possible. Eat well - at higher levels your appetite will diminish. Day 4: From Shira you will set off to Barranco (3 900m), skirting just below Lava Tower - you are now walking at approx altitude of 4 000 m, around the southern side of the mountain. A few steep sections and valleys, a small section of scree and rock, some sand 'dunes' - it's a long and fairly tiring day. This is part of your acclimatisation - walking in height from 3 800m up to 4 800m, and then overnighting at 3 900m. Once again, pace yourself to graduate slowly. Tonight you may experience further headaches, nausea and breathing problems. Night temperature - again cold (night frosts). Day 6: Today is a very long and strenuous day. Drink lots of fluid before you start, you will be very thirsty by the end of the day - if you manage, carry 3 litres of fluid with you today. You will be woken at about 00h30 or 01h00 with tea and a biscuit. Put on all your clothing ready for the final ascent. You will be climbing up scree for approximately 4-5 hours. The guide will stop frequently to rest and check on his group. It is very important to listen to your body and breathing and try to get into a rhythm. Because of the slowness of your walk, your fingers and toes are likely to get extremely cold - three pairs of socks should be considered for today and two pairs of gloves (inner and warm outer). The views from the mountain (on the way up) are spectacular - you gain incredible height over a short distance. You arrive at Stella Point (5 750m), just at the top of the crater, have a rest - the sun should be shining! From here continue on a relatively easy path up to Uhuru peak (5 895m), the highest point in Africa. Your water bottle is probably frozen at this stage, and on reaching the summit there will be a certain relief amongst the group. You will descend from Stella to Barafu. Depending on the timing of your summit, you will be able to have a short rest here (maybe a short sleep) and something to eat, before continuing down the Mweka Route. You will travel down quickly on the scree gasping in more oxygen, step by step. This is a long descent, and Mweka always seems to be on the 'next hill' - never arriving. It is likely you may experience seizure of joints - particularly knees today - keep a support bandage with you for this descent, and perhaps some anti-inflammatory pills/cream. Arrive Mweka (3 100m), late afternoon, on the edge of the rainforest, overnight camping. Time to reflect on the day's achievements. Day 7: A three to four hour pretty descent through the rainforest to the Park Gate at Mweka, where the vehicle will meet you. There are generally beers and cokes for sale at the park gate. Transfer by vehicle to the hotel (approximately 45 minutes drive) ready for an evening of celebration by the swimming pool. Your certificates are generally handed out by the guides (either at the gate or on occasion they may join you for a celebratory drink at the hotel). Overnight Keys hotel, with bed & continental breakfast included. Liaise with your head guide regarding tips - we recommend approximately USD 90-100 per climber, which the guide will apportion out amongst the group. Any old clothes, shoes, etc. would also be most appreciated. If you feel at any stage, any pressure regarding tips, please make sure you report this on your return to the hotel to the management and it will be taken up accordingly. Whilst tips are compulsory, and the above figure is 'expected' - anything above that is totally at your discretion. Check with receptionist that flights are all ok, and your departure time for the following morning. Day 8: Keys Hotel will meet you at reception this morning (they will advise you the exact time to meet) and transfer to Kilimanjaro International Airport for your flight on Air Tanzania departing in the morning, arriving Johannesburg around lunchtime.